Our top-notch neighbor, friend, and cyclist brought home the bacon this weekend. 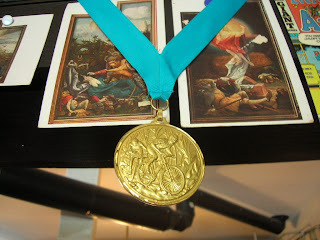 After a quick fueling of a triple espresso (HypnoFuel, as it is known in racing circles, and yes it is legal according to UCI), Mackie participated in the Middle Mountain Momma twenty-one (21) mile mountain bike race, and brought home the First Place Gold Medal that currently adorns our wall behind the counter. Look to the right of the bull horns and, of course, all praise Mackie!